Chrome plated steel. Three layer chrome plating: nickel/nickel/chrome. 2-piece construction: Steel outer rim and steel center. Standard or reverse patterns available. Universal lug pattern: 5 on 4.5", 5 on 4.75" and 5 on 5". Lug nuts and washers are not included. These wheels require mag- style lug nuts with a .750" shank length. Available at extra cost. Will not fit applications with 14mm studs. These are not hub-centric and are best balanced from the stud-holes or lug-centric style. Rust is not covered and is a maintenance issue. Please click here for the full warranty on these wheels. Mr. Eddie Hall owns this exquisite 1964 Impala. 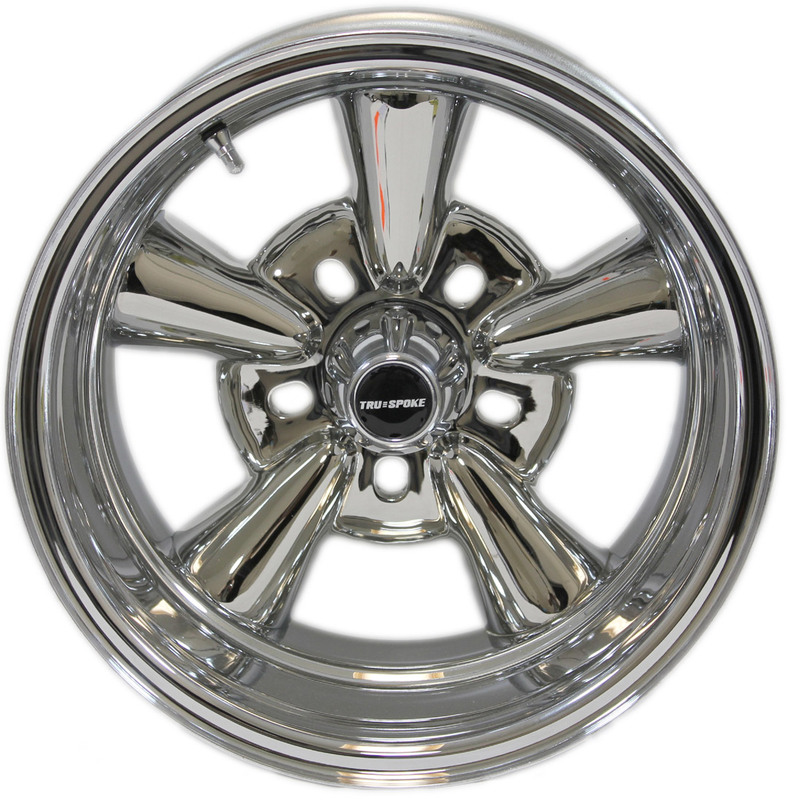 The wheels are Truespoke Supremes, size 14 X 6 inches - REVERSE style. The tires are BF Goodrich Silvertowns, size 185/70R14 steel belted radials with a 2.25 inch whitewall. The wheels also run our 3-bladed spinner kit. The wheels and tires are available as a package. Please email or call us for more information. balance for you. Simply bolt them on and enjoy. We offer all major brands of whitewall and blackwall tires. Thank you. Below: Standard center cap with emblem is included with all wheels. Left to right: Backside of wheel.Note exclusive reinforcement bar. Right: 15 X 7" Standard, front and 3/4 view. Far right: Reverse style 3/4 view. Custom Pontiac, Ford truck and Cadillac photos courtesy of Rynobuilt - SW Missouri. Both the Pontiac above and Cadillac below run 15 X 7 inch standard Supremes with narrow whitewall P205/70R15 tires. Please click on photos below for larger image. Presses in from the back of the wheel and held in place by the brake drum or hat. $10.00 each. The koolest lug nut ever. Perfect touch for your Supreme wheels. Kit includes 20 Bullet Lug Nuts AND 20 correct washers. Standard lug nuts and washers kits are $50.00. Please specify your bolt pattern when ordering. Round and oblong washers are used depending on your bolt pattern. Specify your thread pattern when ordering. 7/16", 1/2" or 12mm X 1.50". Price: $3.00 each. Use oblong washer for 5 on 4.5" and 5 on 5" bolt patterns. Round style washer is used for 5 on 4.75" bolt pattern. Shank lug nuts for your Supreme wheels. These lug nuts have a 3/4 inch shank and are mag-style. Select your thread pattern: 7/16", 1/2" or 12mm X 1.50". These lug nuts are for Supreme wheels only and require a washer which is not included but is available for $1.00 each. Lug nuts are $2.00 each. Right: Hi Truespoke®, here is a picture of my '63 sitting on True Spoke 14" Supreme Wheels and Coker Premium Sport Tires. Thank you guys for the great customer service you all have provided! I'm running 14x7 reverse up front and 14x6 reverse on the rear. I may have been able to fit 14x7 on the rear but I do have plans to lay the impala down lower both front and rear, I currently have an air ride system that will be tuned to drop lower so I think this was perfect. Above: Rynobuilt of SW Missouri Ford truck runs Truespoke® Supreme wheels. Front-size: 14 X 6" standard style. Rear size: 14 X 7" reverse style. Tire size: 195/70R14 front and rear. "These Wheels are perfect for my Late 60's custom." Rynobuilt 1964 Chevrolet wagon with Truespoke® Supremes and 3-blade knock-off style spinners, available at extra cost.